I see a spaghetti-tangle of aircraft travel corridors. 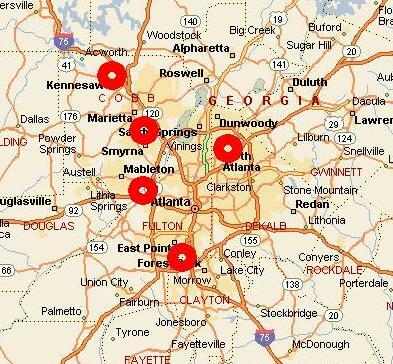 These are the airports within 30 miles of Atlanta that have instrument landing systems. Hartsfield-Jackson Airport (the southernmost red blob) is, of course, the world’s busiest in terms of takeoff and landings as well as numbers of travelers. The second from the top-left red blob is Dobbins Air Reserve Base, home to a fighter wing, a maintenance facility, a training facility, and Lockheed. The other blobs are airports without commerical airlines, but still plenty of traffic. The skies over Atlanta are rarely free of aircraft. Transportation Secretary Mary Peters was here last month and announced some federal funds to help study ways to keep Hartsfield-Jackson operating effectively into the future with all the expected growth. One of the options to be considered is a second large commerical airport for the region. Wow. That is the sort of project to make engineers’ mouths water. Build a large new transportation facility from scratch. Controversy immediately kicked off. Delta and AirTran, Hartsfield-Jackson’s largest tenants are against any second airport for their own reasons, some of which might make sense, but others of which sound like “don’t make us compete with other carriers.” The City of Atlanta seems to be against it because it would be outside the city (there’s no space large enough inside) therefore no tax base. The various surrounding counties seem to be against it because their large tracts of relatively undeveloped land would make the ideal location for a new airport and its attendant noise, development, etc. In fact, I’m not sure anyone is actually for the project, except for every single airline passenger I’ve spoken with around here, me included. Most people seem to think that the logical place to put a new airport would be somewhere on the northern side of the city. I agree, if only because it would cut my time to get to an airport by 75% or so. Of course, there’s no telling what airlines would fly into a hypothetical ATL2, but you can bet that the citizens north of I-285 would flock there. Whatever comes out of this bruhaha, you can bet that we’re still years away from any sort of construction. This entry was posted in Atlanta, Transportation. Bookmark the permalink. A second ATL would be good news for Sensis. We’d probably get to install another large aircraft ground movement surveillance system.